We’re casting NATIONWIDE and coming to the below cities. Looking for AMAZING home cooks! 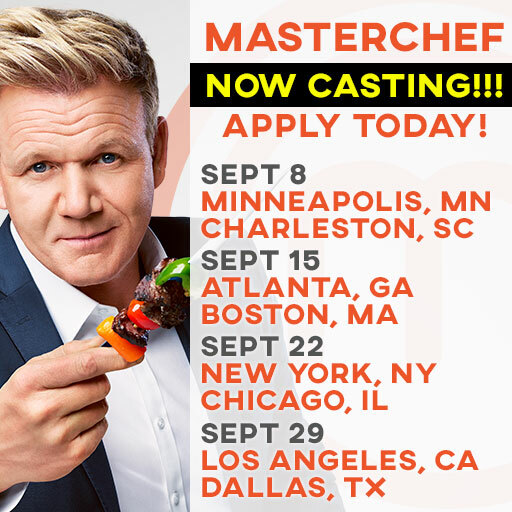 How do you sign up for the new Masterchef audition in Dallas, Tx? I Would love to be an extra, I’m 58 years young, mother of 2 38, 23 andI have 2 grand kids 15, 2.. I LOVE THIS SHOW . I applied for season 9 and it went well. I’m not gonna stop til I get face to face with Gordon to show him what I got. I’m with Masterchef. Cause I am a foodie kind of person. They always bring something New and amazing. Best of Luck to the participants.